Come on in y’all and welcome to my fall home tour! I’m glad you hopped on over from All Things with Purpose. Don’t you just love Sarah’s bright and cheerful home? 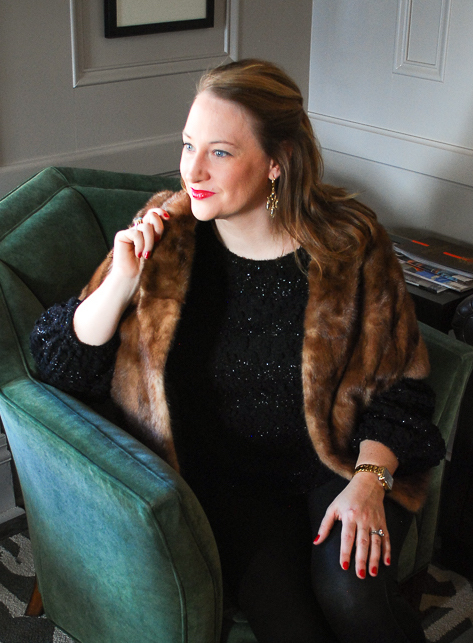 I’m excited to share my fall home style this week along with 8 other fabulous ladies in the Simply Seasonal blog hop hosted by Caroline at Organize Nashville. 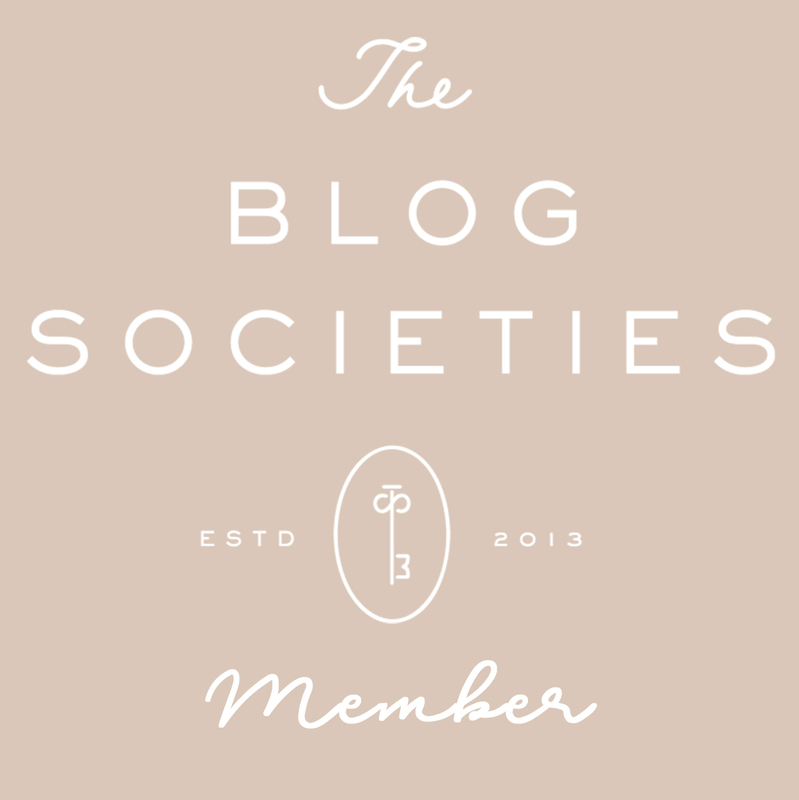 Be sure to check out the rest of the bloggers in the tour listed at the bottom of this post! Y’all know how much I love seasonal decorating. For me it is an important part of making my house a home and embracing gracious living. Plus, there is no better way to subtlety change up your home decor than by adding seasonal touches. With Simply Seasonal this week, we’ll be talking about getting your house ready for autumn and spilling our secrets to make your house a home this season. 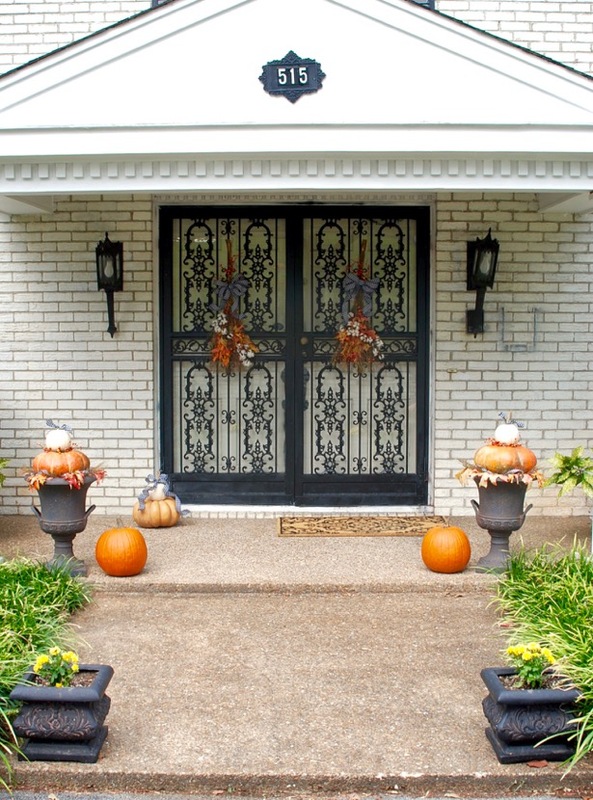 Adding seasonal decor at the front door is an absolute must. Not only does it offer the first impression to guests, but it also makes the neighborhood more festive. Plus, coming home to colorful pumpkins and mums is way more charming. 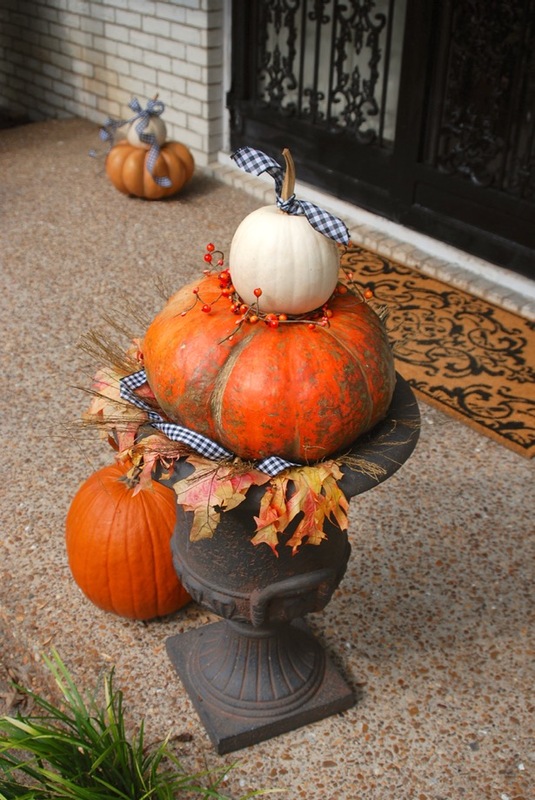 You can go all out with a bountiful display of pumpkins and gourds or keep it more simple with an elegant autumn wreath just be true to your decorating style. 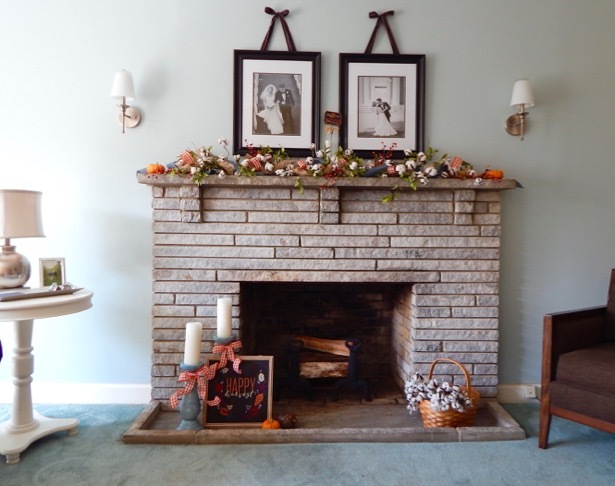 Using varied textures in your seasonal decorating adds visual interest and dimensionality. Just take a look at the pumpkin urns above. Adding different textures with the fall berries, leaves, and the golden tinged branches made this grouping more interesting and appealing. 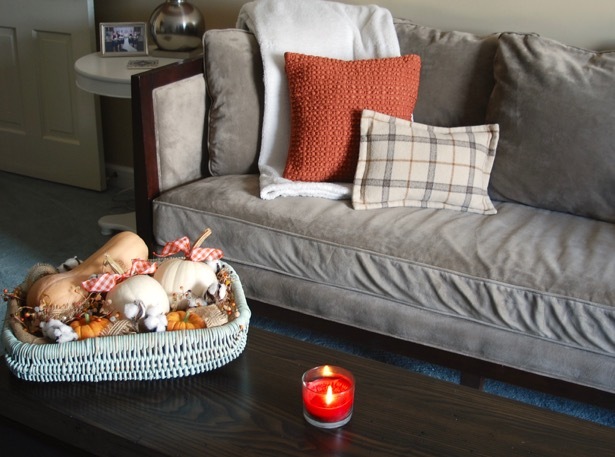 Texture is also important to making your home feel more cozy for fall. So get out those fuzzy throw blankets! Want more advice on decorating with texture? Check this post out! Side note: please excuse our hideous carpeting situation. S. and I are renovating this 1960’s brick colonial. Wood flooring is high on our to do list! Have you noticed the decorating theme in my fall home tour yet? It’s gingham! 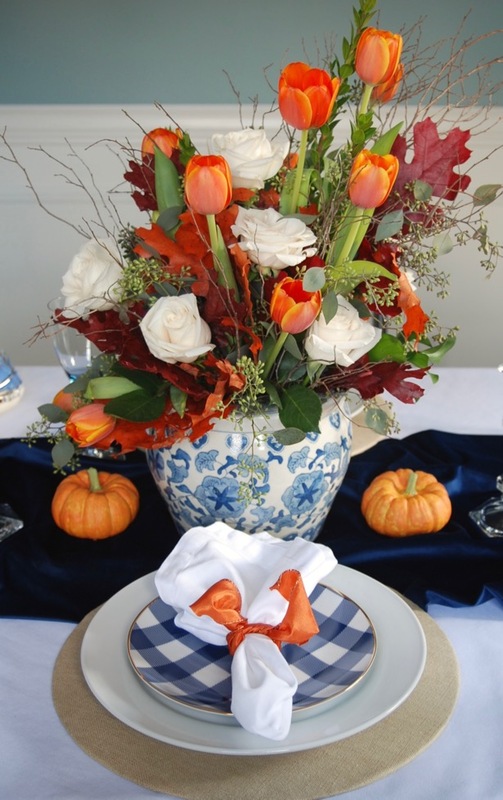 I recommend picking a specific pattern or color palette as a theme to use throughout your fall decor. A theme will help tie your spaces together, creating cohesion from one room to the next. Instead of using the exact same gingham everywhere, I adapted this theme to each room. So the gingham at the front door is black and white to go with the house colors, while in the dining room I used blue gingham plates. 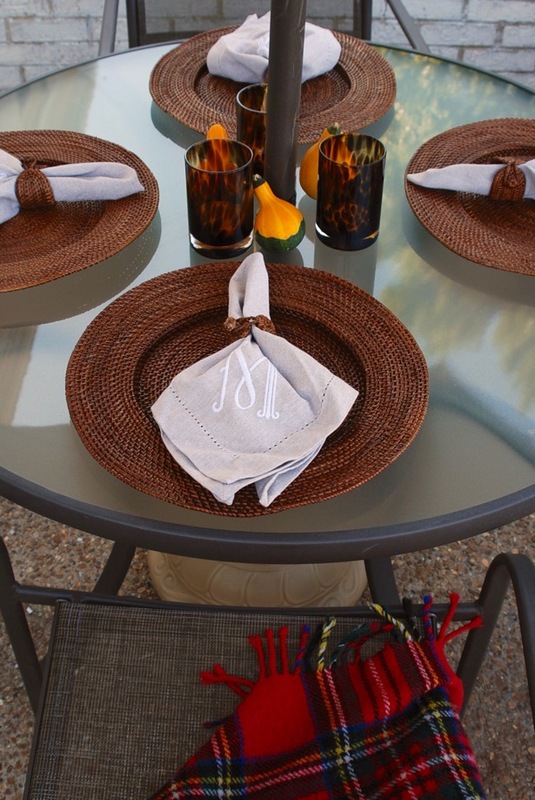 See more of this tablescape here! Seasonal decorating can get expensive, especially if you buy all of your fall florals (wreaths, garland, centerpieces) pre-made. Instead, try creating your own. 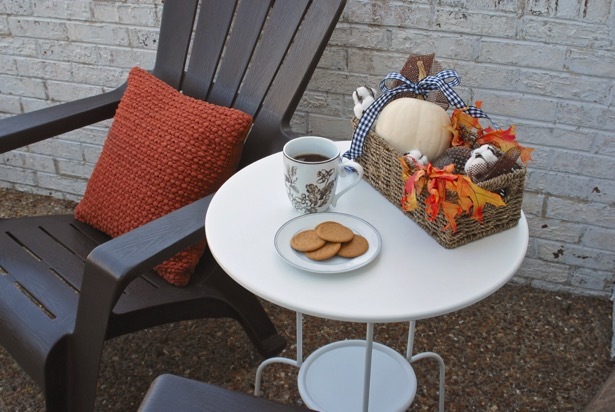 For this fall home tour, I did two main DIYs: the cinnamon broomsticks on the front door and the linen plate chargers on the dining room table. I dressed up the cinnamon broomsticks by spraying them gold and adding cotton boll stems, berry sprigs, ribbon, and fall leaves. Learn how I made the chargers here. Crisp, cool fall mornings are one of my favorite parts about autumn. I love to bundle up and take my coffee outside to soak up the fresh air, so I wanted to make our balcony more cozy for the season. To do this I made a seating nook in one corner, adding a pillow and end table. 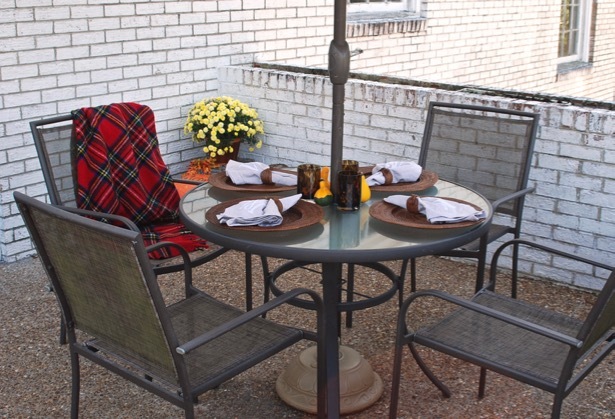 Then I laid a casual table on the patio set, and tossed a plaid blanket over one of the chairs. 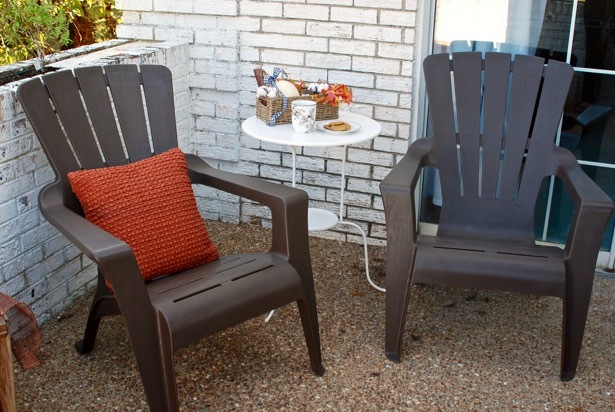 Mix in a few pumpkins and mums for a casual but cozy outdoor space. Thanks for visiting my fall home tour! 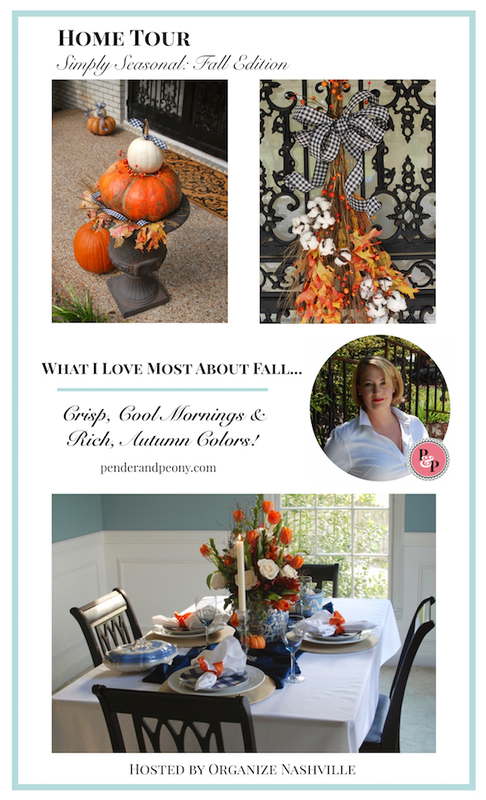 I’ve loved sharing #myfallhomestyle with you. We will be using this hashtag on social media this week. Tag your fall decor to join in the fun! Send me the guide, please! 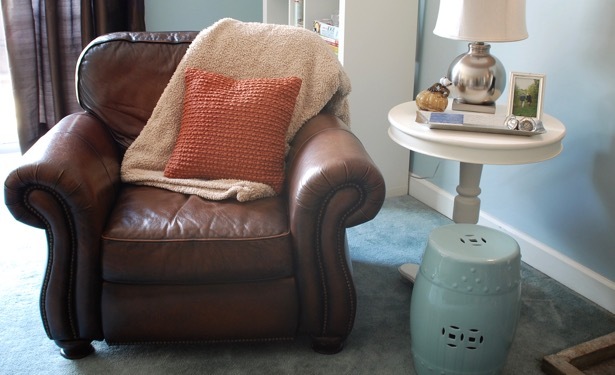 Tomorrow October 4th, 3 more bloggers will be sharing their fall home style with y’all. Next on the tour is A Purdy Little House. Her black and white striped pumpkins are AWESOME! It all looks so lovely! The dining room wall color is so nice!! Thanks Shelley! The paint is SW Interesting Aqua. We just did it! Your dining room is beautiful – I love the wall color 🙂 It is so nice to meet you and get to tour your home!! Thanks Sarah! I’ve enjoyed connecting with you too. 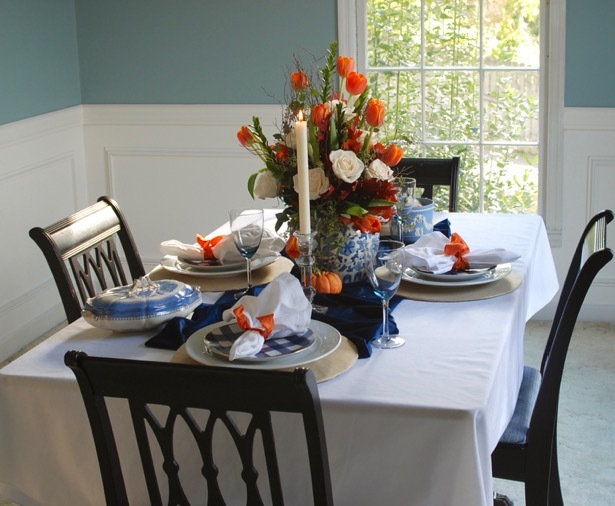 Love love love your dining room tablescape and flower arrangement. The whole house looks so cozy and inviting. Wonderful home tour!!! Thanks so much Sue! This has been a great hop! I love how you decorated your dining room table. The blue and orange is so pretty! Thank you Julie! I love blue and orange for this time of year! We all rocked this blog hop, I can’t wait to see how the series continues!! Your tablescape is perfect! I love that flower arrangement!!! And those pumpkins… fall-tastic! Danielle, me too! Thank you – go check out the full tablescape when you get time. I just posted it yesterday.